The Grumman F6F Hellcat was a carrier-based fighter aircraft developed to replace the earlier F4F Wildcat in United States Navy (USN) service. Although the F6F bore a family resemblance to the Wildcat, it was a completely new design powered by a 2,000 hp Pratt & Whitney R-2800. Some tagged it as the "Wildcat's big brother". The Hellcat and the Vought F4U Corsair were the primary USN fighters during the second half of World War II. The Hellcat was the first USN fighter for which the design took into account lessons from combat with the Japanese Zero. The Hellcat proved to be the most successful aircraft in naval history, destroying 5,271 aircraft while in service with the U.S. Navy and U.S. Marine Corps (5,163 in the Pacific and eight more during the invasion of Southern France, plus 52 with the Royal Navy's Fleet Air Arm during World War II). Postwar, the Hellcat aircraft was systematically phased out of front line service, but remained in service as late as 1954 as a night-fighter in composite squadrons. Grumman was working on a successor to the F4F Wildcat well before the Japanese attacked Pearl Harbor. While the F4F was a capable fighter, early air battles revealed the Japanese A6M Zero was more maneuverable and possessed a better rate of climb than the F4F. The F4F did have some advantages over the Zero. Wildcats were able to absorb a tremendous amount of damage compared to the Zero, and had better armament. The F4F was also much faster in a dive than the Zero, an advantage Wildcat pilots used frequently to elude attacking Zeros. Like the Wildcat, the Hellcat was designed for ease of manufacture and ability to withstand significant damage. A total of 212 lb (96 kg) of cockpit armor was fitted to aid pilot survival, as well as a bullet-resistant windshield and armor around the engine oil tank and oil cooler. Self-sealing fuel tanks further reduced susceptibility to fire and often allowed damaged aircraft to return home. 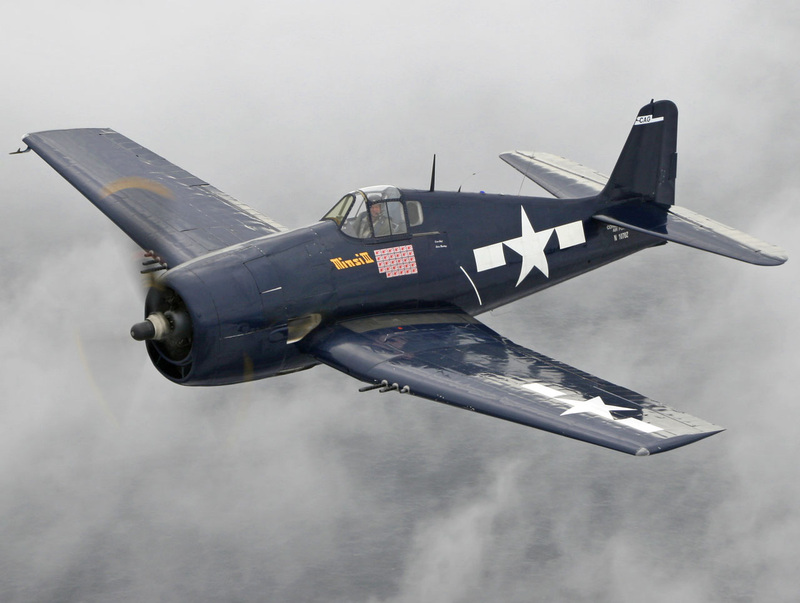 The U.S. Navy's all-time leading ace, Captain David McCampbell USN (Ret) scored all his 34 victories in the Hellcat. Instead of the Wildcat's narrow-track undercarriage retracting into the fuselage requiring awkward hand-cranking by the pilot, the Hellcat had hydraulically-actuated undercarriage struts set wider and retracting backward, twisting through 90° into the wings, exactly as the Chance Vought F4U Corsair's landing gear did. The wing was low-mounted instead of mid-mounted and folded the same way as the later versions of the Wildcat, allowing the Hellcat to take on a compact, tucked-in appearance on a flight deck. The last Hellcat rolled out in November 1945, the total production figure being 12,275, of which 11,000 had been built in just two years. This impressive production rate was credited to the sound original design, which required little modification once production was underway.